Ali had suggesyed we did the Bakewell Park Run on Christmas Day and why didn't I run it with Chip. I have to admit that I hadn't been interested before as it's just out and back on the monsal trail and there is much nicer running round there, also I wasn't sure about running chip somewhere so busy. Since I have been working on my running style and Chip have getting faster I decided to give it a go. 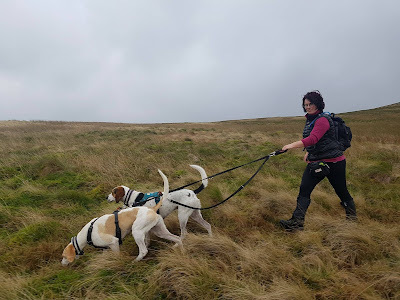 I went the sat before dogless to check it out and ask if it was okay to start at the front, the event director kindly agreed, normally they ask dogs to start at the back. 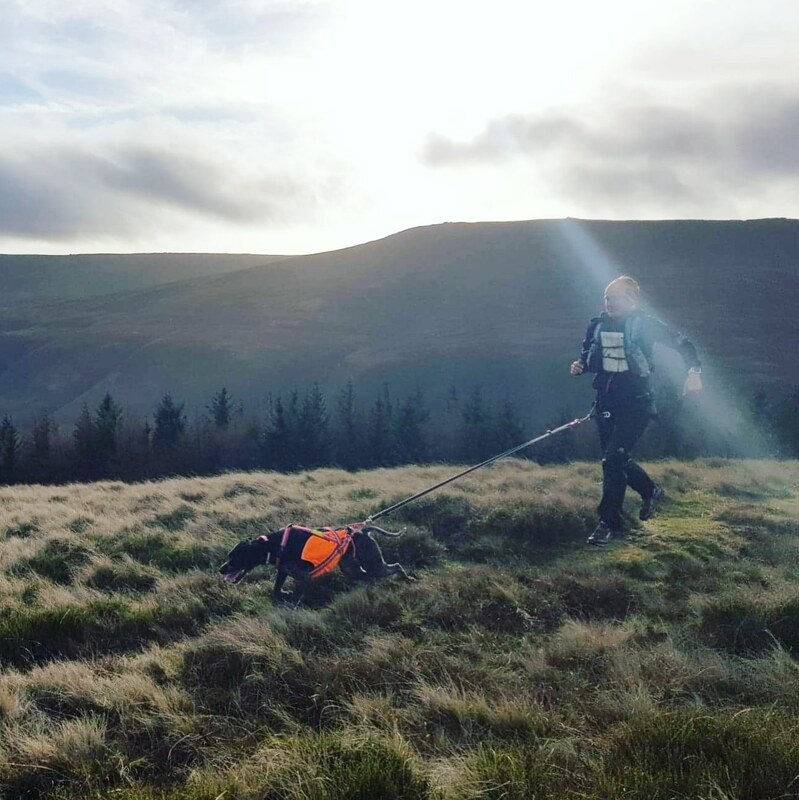 On the day we had a fantastic run getting a fantastic pb. Chip was a star coping with the legs around us. 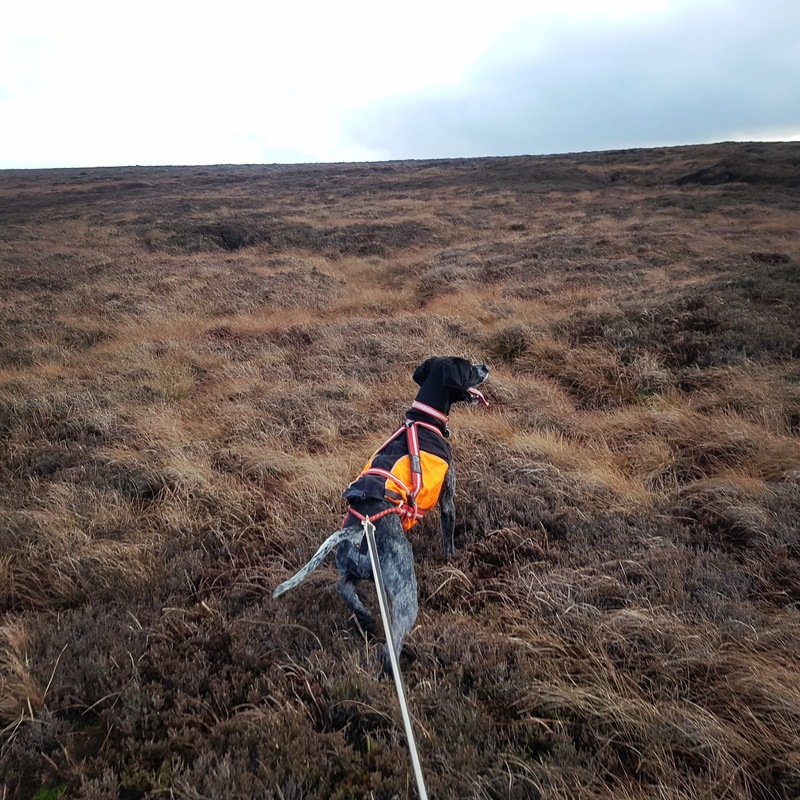 Saturday me and Abbi set out from the Snake Pass Inn to recce a route she had plotted as a possible group run. The forecast was cold with possible snow showers turning to rain, with Black Ice on the roads. We set off onto Snake Path and found the equivalent of black ice on the trails. 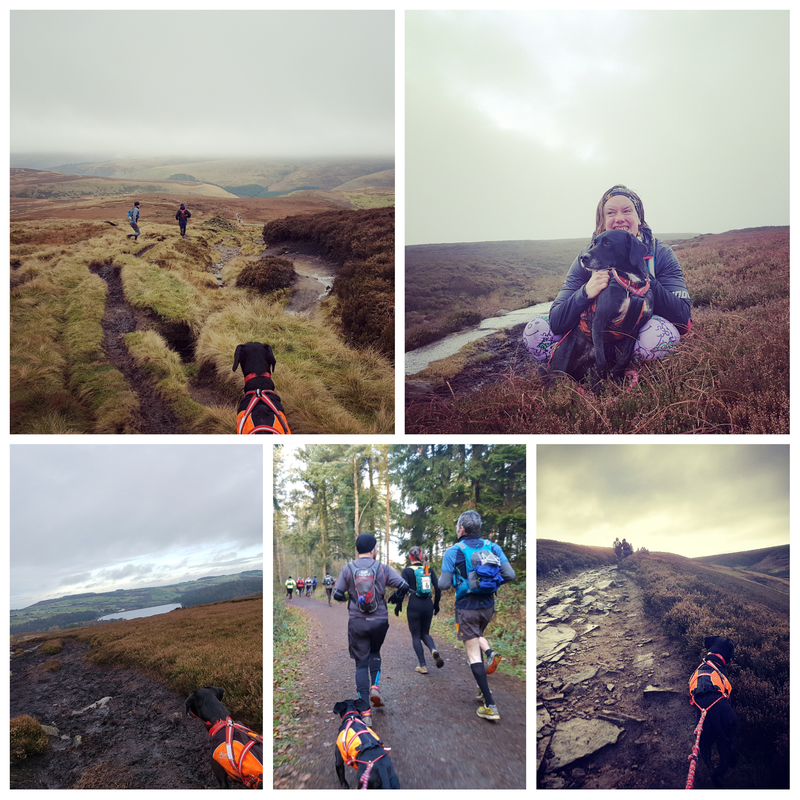 I expected slippy rocks, but the mud was ice and you couldn't see it! With the rain beginning to fall I popped my emergency waterproof trousers on, something I was very glad of later. 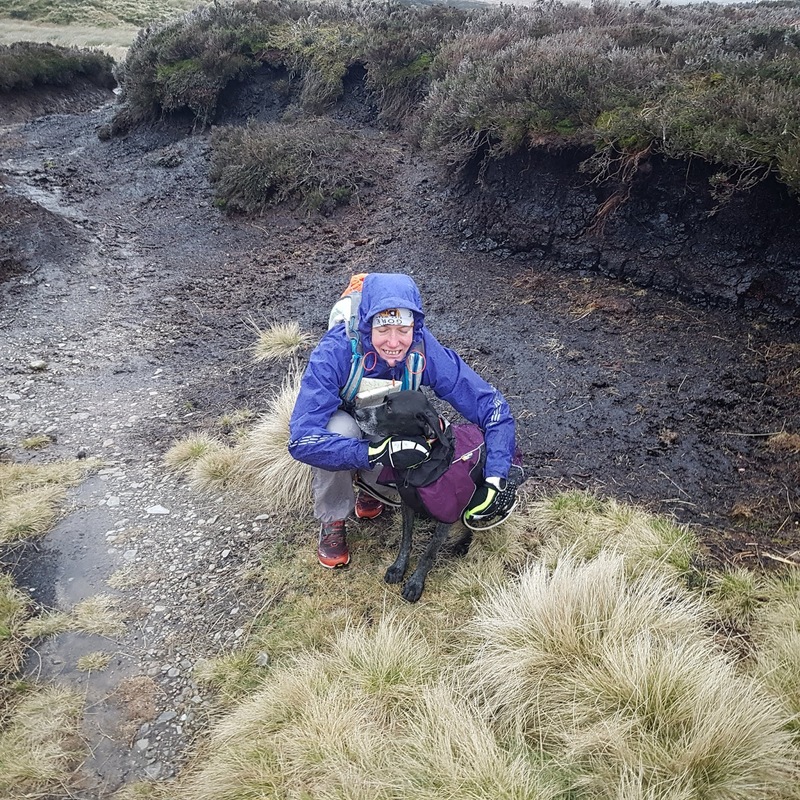 Getting up onto Kinder the weather was getting bad, very windy and basically ice falling from the sky, all our zips on our rucksacks were frozen shut! 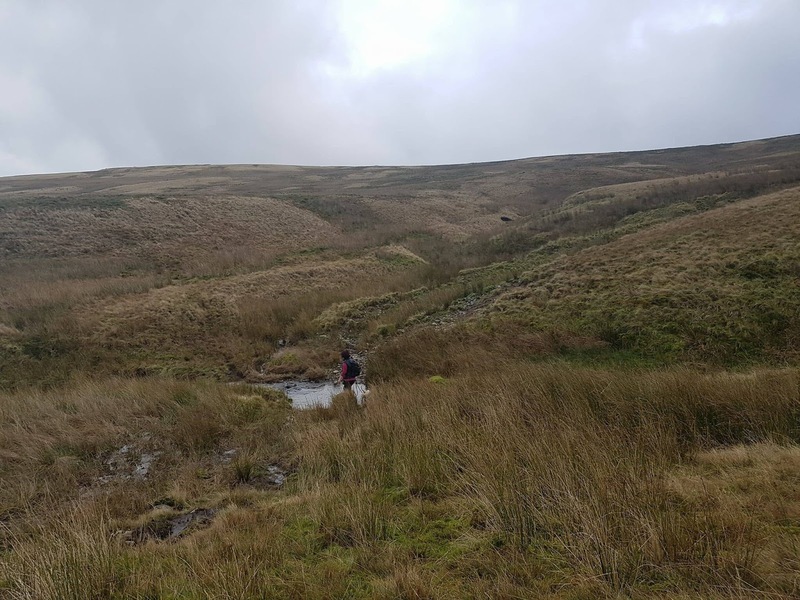 We made a decision to drop down off the edge and follow a lower path, unfortunately there was no actual path on the ground so it was hard work making our way across Moor land. 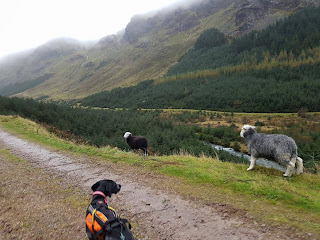 With Abbi's dogs getting good frozen fur, they're cockapoo's so more fur than chip, and it starting to get close to getting dark, we got my emergency shelter out (which I nearly didn't carry), got the dogs defrosted, added some layers, got zips defrosted to get my head torch out. We then made a plan to drop to the path we had come up on and it was easy to follow. We got down to the other side of the river and found a footbridge to cross, only it was covered in sheet ice and had no sides. The only way across was to crawl. 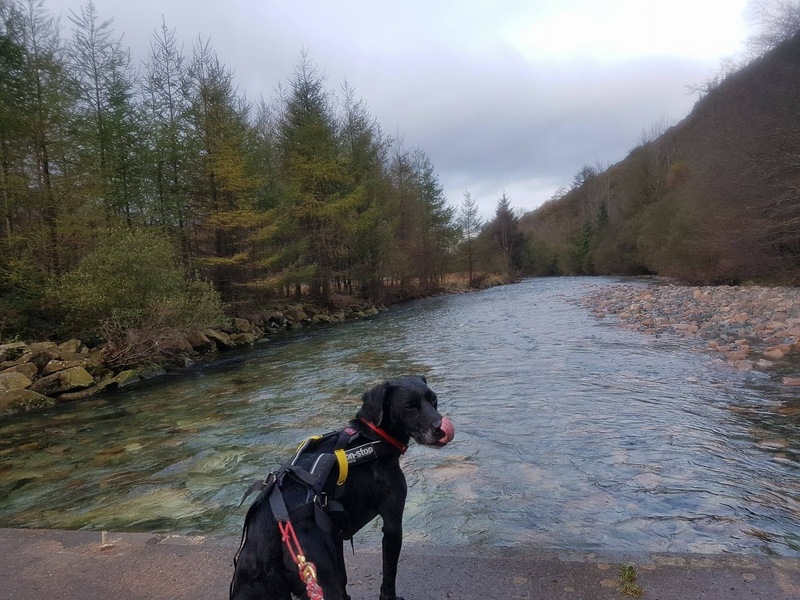 Chip refused the bridge and went across the river, only trying to use a rock to stay drier she slipped into the river on her back, I had to crawl the rest of the way across the bridge and pull her in and drag her out, fortunately she was in three coats and she stayed warm! When Abbi crawled across she lost her map, glad we both had a map with us. All that was left then was to slowly pick our way back down the path as it got dark. But at least we were confident with how to get back. 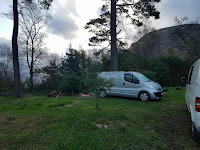 We were so glad to get back to the road and back to the vans, it was straight in, get chip changed, get me changed and then into the pub for tea. It's a long time since I've felt that scared on the hill and shows how important it is to carry emergency kit. So glad to be there with someone else with the hill experience and the right kit. 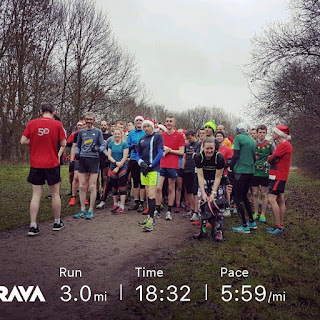 We decided that it wasn't ideal as a group run as no good bailout options and the weather can change so quickly up there. A morning Run up the Edges. 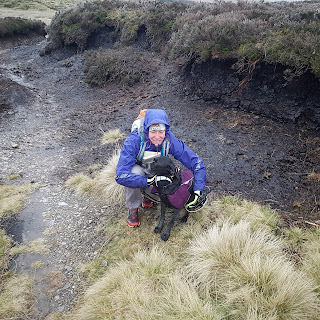 Laura and I met up at Curbar Gap this morning for a run, I had told her we didn't need to worry about it being busy as the Peak District only opens at 10am. 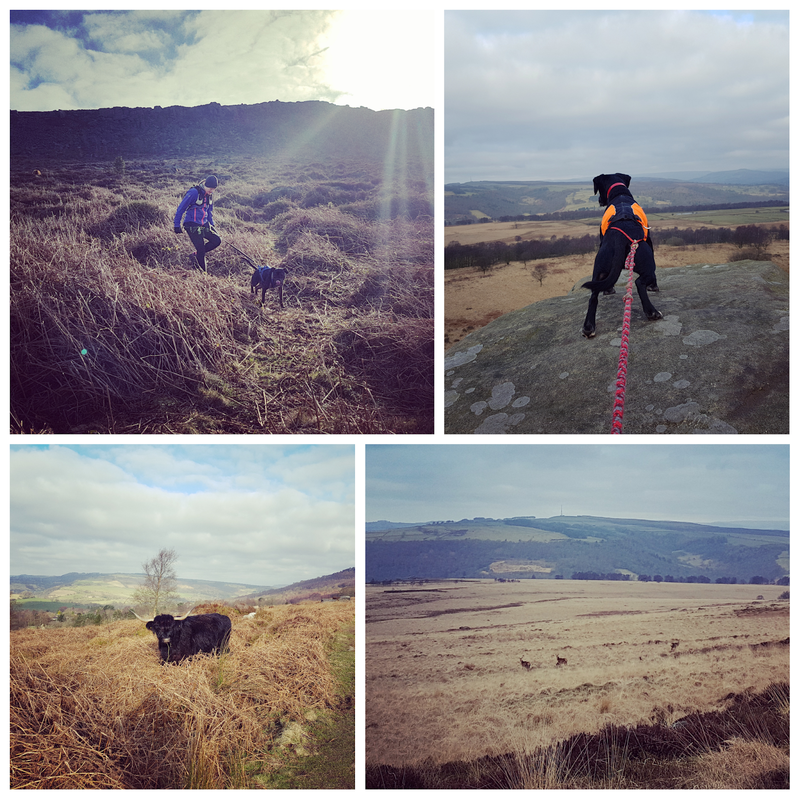 We went out along White Edge where the deer were as close as I've seen them in a long time, back along Froggatt dropping down under Curbar and along under Baslow where we met the Highland Cooos. Back over onto White Edge we arrived back at the car park after 9.5 miles to a busy car park and lots of people heading out. Meanwhile we'd had empty trails most of the time. 6.5 miles in glorious sunshine. 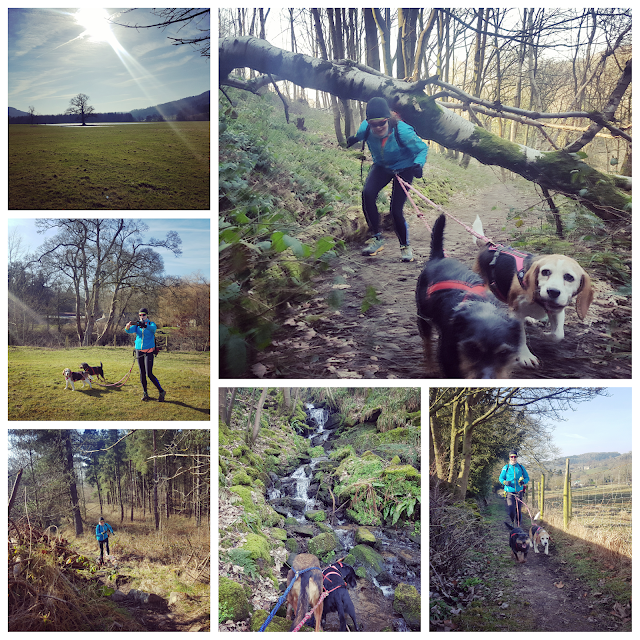 It's felt a very wet and muddy winter and then i ended up not running much in January due to illness so it was lovely to get out today and have sunshine and trails that weren't completely muddy. 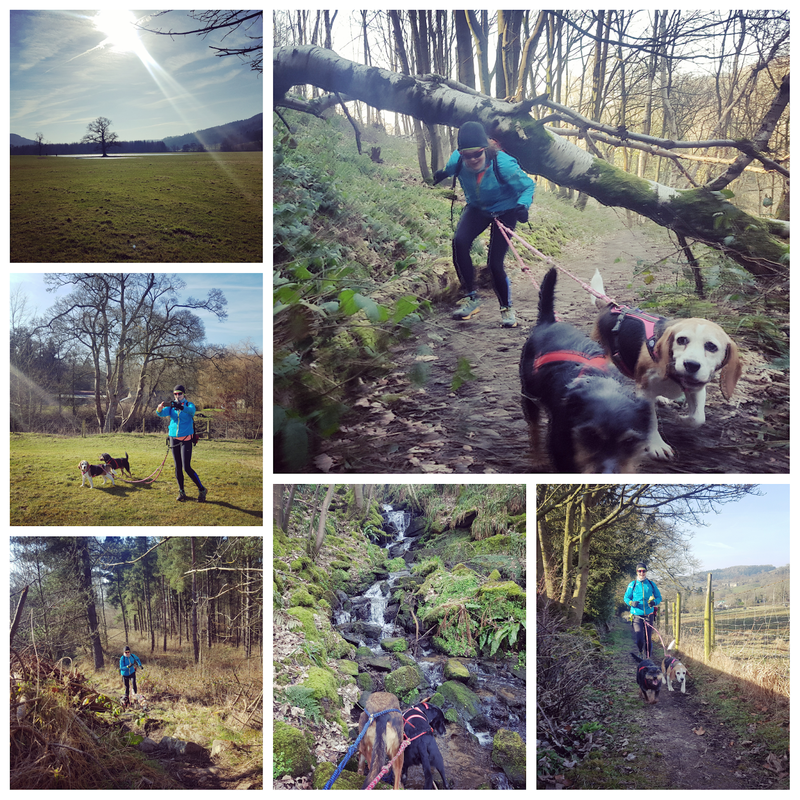 We ran fro Rowsley to the edge of Chatsworth and back and hardly saw anyone else. The singletrack through the woods was especially fun. Lovely to be getting the miles in again! 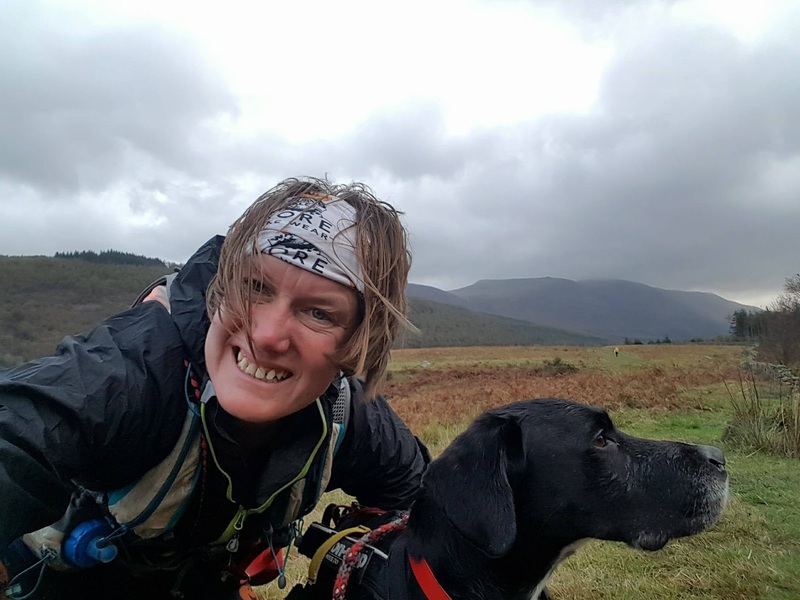 I contacted the organisers of this race a while ago to ask if I could run with a dog, explaining that he would be attached to me on a short lead at all times and I had my own insurance. They kindly agreed and I decided to take cybi as the route went over cut gate which I know can be boggy. He will just keep going, chip wouldn't enjoy it. Getting close to the event I was nervous as I hadn't done much running in November due to illness but the Monday before cybi and I did ten miles so I was confident we could do the distance, fourteen miles. 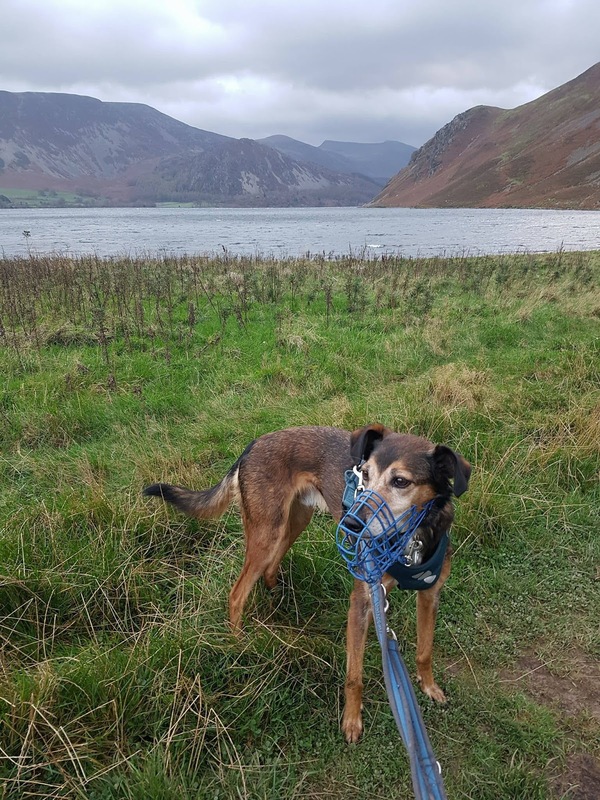 The day came and I kept cybi away from the start so he didn't get over excited, once they started going we joined the back and he was a star walking and jogging till the field spread out and we worked our way through on the first hill as cybi obviously thought I should be running it. It was a lot less boggy than expected as it was cold but that meant a lot of ice. One bit even cybi slide on! 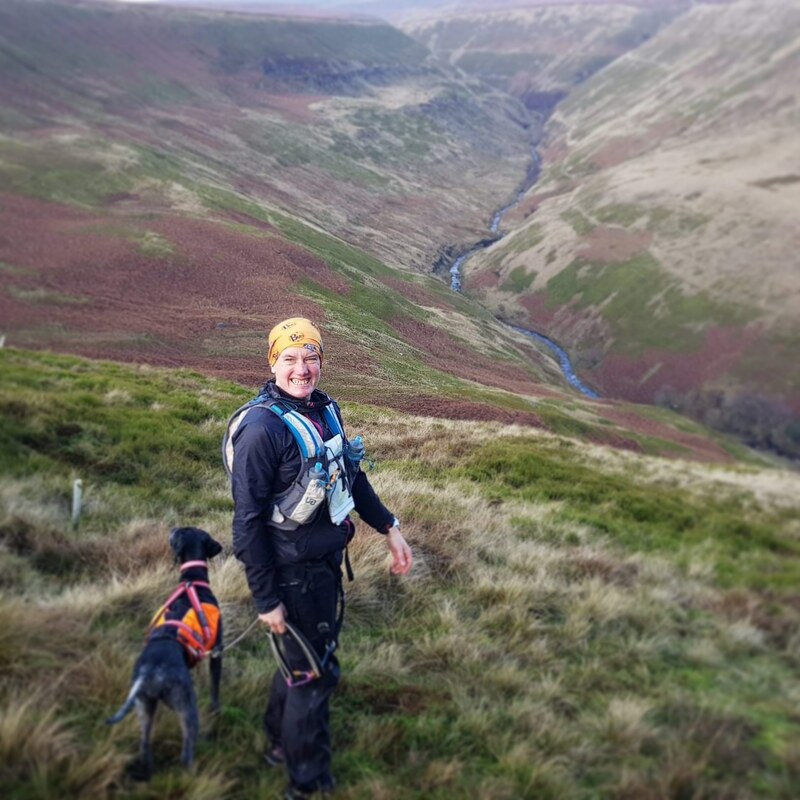 Soon we were descending to Howden Reservoir and the views were stunning. Some easy running along Howden and we turned off leaving the marathon runners to their longer route. 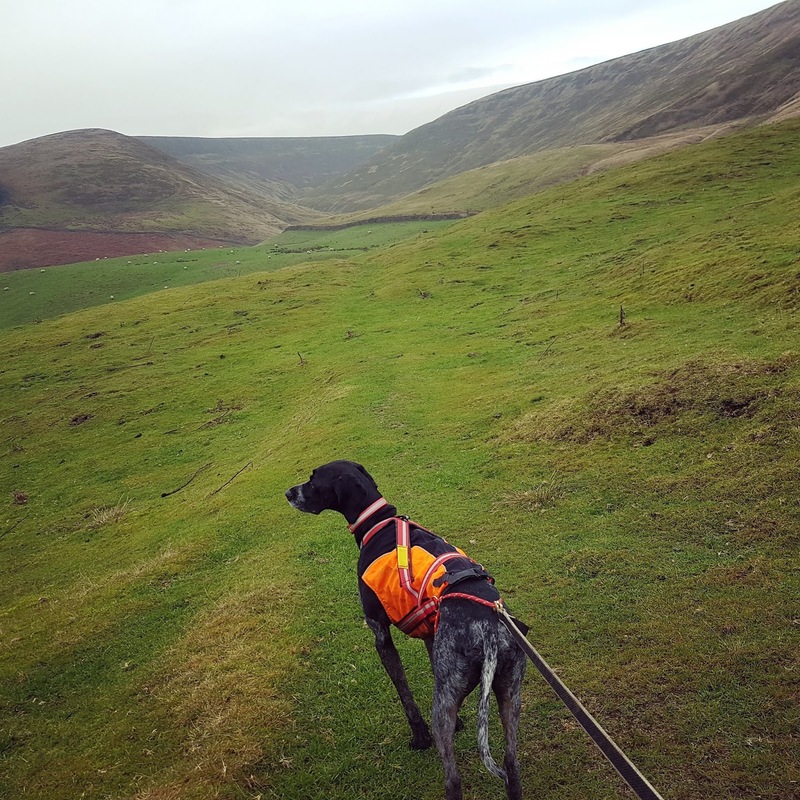 It wasn't long before we started the steep climb up to the edge, near the top I was even using my hands, cybi kept an eye on me as he had no issues. From there it was nearly all descending back to langsett reservoir. Here there was a short section of road before a last climb to the finish. A brilliant route and so pleased I got to run it with the wee man, who turned left for another lap at the finish! 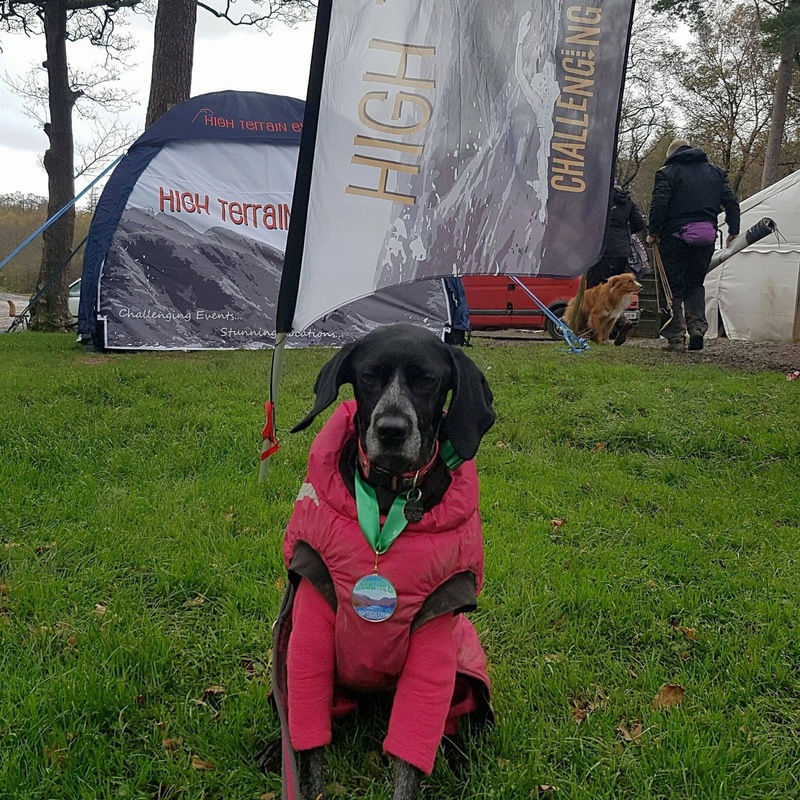 A friend mentioned that High Terrain Events are dog friendly and I spotted one at Ennerdale in the Lake District back in the summer and decided to enter as it was a part of the lakes I hadn't been to and there was camping at the start if required. There was a choice of a 10k, a 25k or a 50k race I decided to go for the 25k as the 50k was just two laps and the 10 just part of the 25k route. This meant I would be racing on the Sunday but it is a long way so I headed up on the Friday for the weekend. 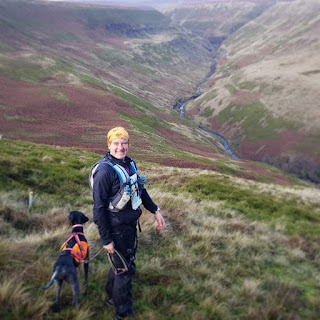 On the way up, after spending way to long sat in traffic, I met up with a Canicross friend Helen and her two trailhounds and we went for a lovely 4.5 mile walk in the Howgills, somewhere I love as its so quiet and so beautiful. After a hot chocolate and cake at Tebay I headed off to Ennerdale, arriving at the Scout camp just before dark. I was given a choice of where to park up and went for the most out of the way spot even though that meant there wouldn't be a quick getaway. Meant the dogs didn't have anyone wandering past them at any point. Van set up I made myself tea and with the weather getting worse, wind and rain, curled up with a book before falling asleep early. I woke up loads in the night, probably the wind and was up and about early. 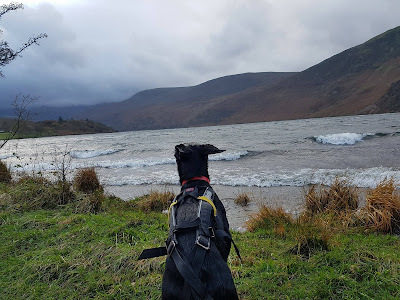 On Saturday it was the turn of the 50k Ultra runners so after a walk along the last part of the course with Chip and George, which meant my first view of the lake and an idea what the terrain was like I headed out with Cybi for a run along the 10k route. I wanted to make sure I was well out of the way before the fast ultra runners caught me. The route started along the southern lake shore and the wind was so strong it was blowing the water into the lake wall where it was splashing up and covering us, well at least I knew I wasn't going to stay dry, turning onto the West side things improved and it was mainly fireroad, with one muddy section, up to the top of the lake where we turned down the other side. 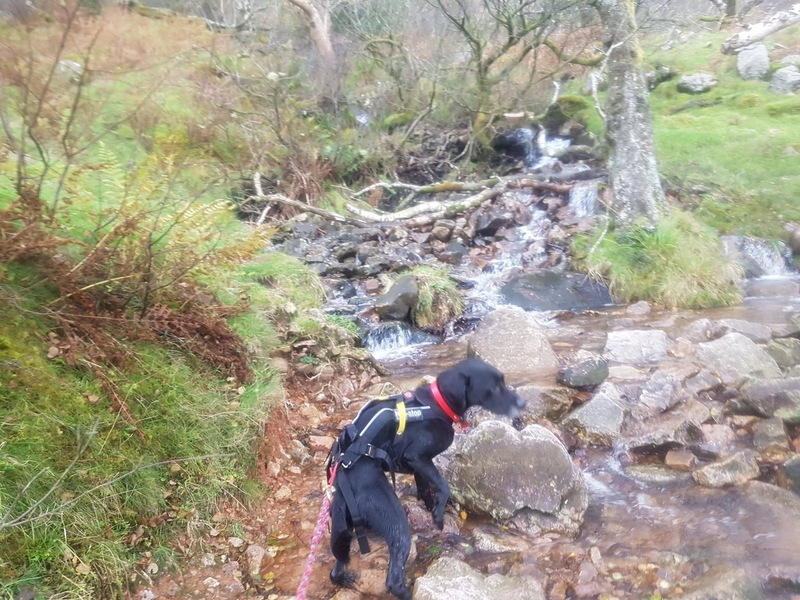 This was vary different terrain, it felt like running along a wet slippy river bed on rocks that were baby head sized, even with Cybi looking after me I was mainly walking. 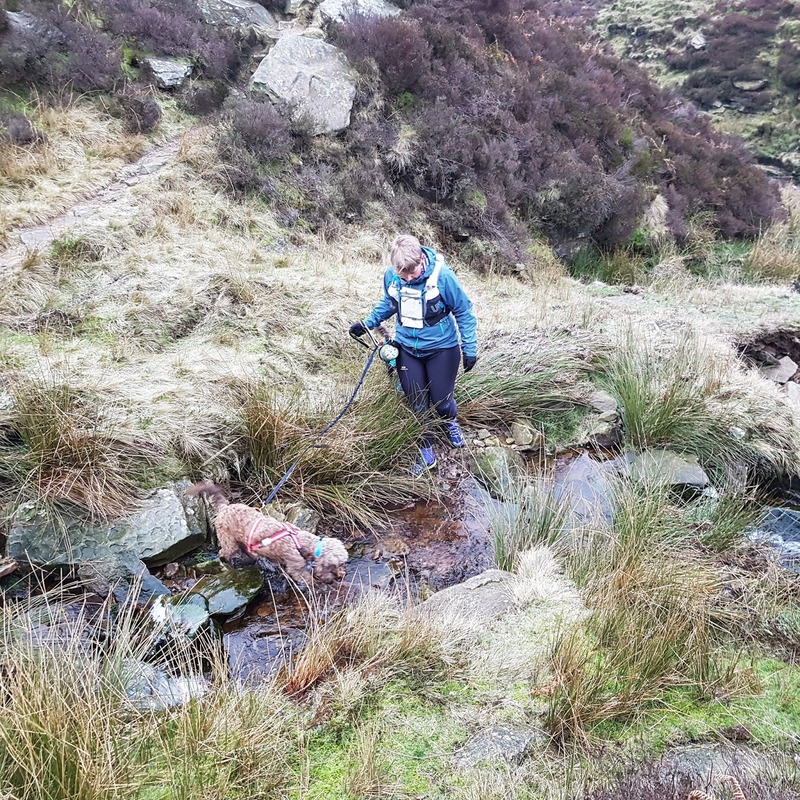 Once we got on the bit that is mentioned in the race notes, below Anglers Tarn it was fine and the bit of scrambling easy enough. We got back to camp too late to see the ultra start though. After an afternoon of chilling in the van with some cheering on the ultra finishers we curled up in bed early listening the rain and wind get worse. Waking up I decided it was a little better and got myself and Chip ready. I spent some time trying to decide which trainers to wear and went with my Altra Lone Peaks, this turned out to be the right decision as most of the trail was hard pack and I did manage the muddy sections in them! It is our first time running a human race without a canicross start so we started at the back and she was a star trotting to heel until the tracks widened out and we could do some overtaking. She got lots of compliments as she trotted out nicely in front of me most of the time, she let me lead the way through the boggy section up near Black Sail Youth Hostel though! 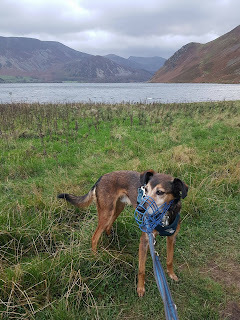 They had changed the route as it had been decided the East side of the lake was just too dangerous in the weather conditions so once we returned to the lake we crossed over and retraced our steps down the west side. 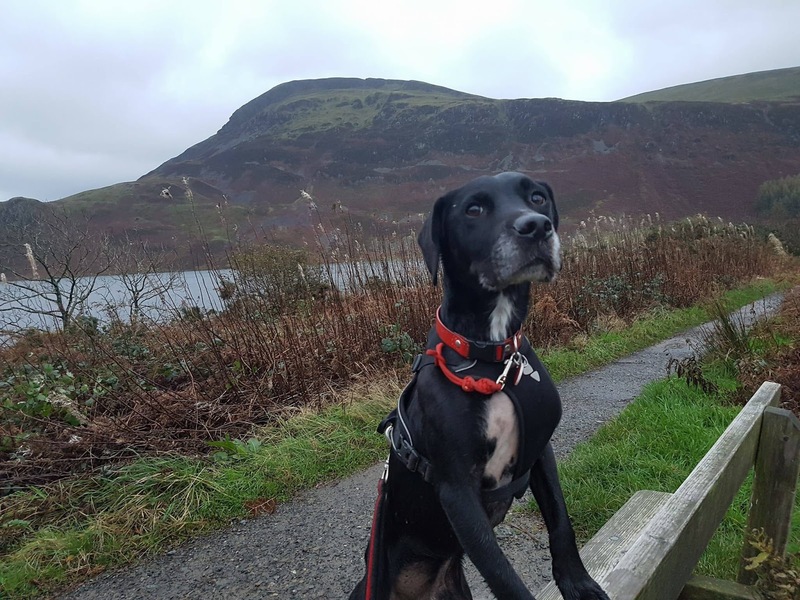 Chip started to feel cold here, well her bum did, so we had a few stops to warm her up and she got a bit scared by a lab who wouldn't leave her alone. But it wasn't long to the finish and we crossed the line in 2hrs 48mins 28secs which I was chuffed with. I did miss the finish line cake though as I quickly took Chip to the van to get warm! This meant we were 72nd overall (out of 113), 12th in our categorey ( F / 20) and 22nd out of all the females in the race (/42). After some lunch it was time for some last walks before packing up and heading home. I'm now looking at what other races they do up there. 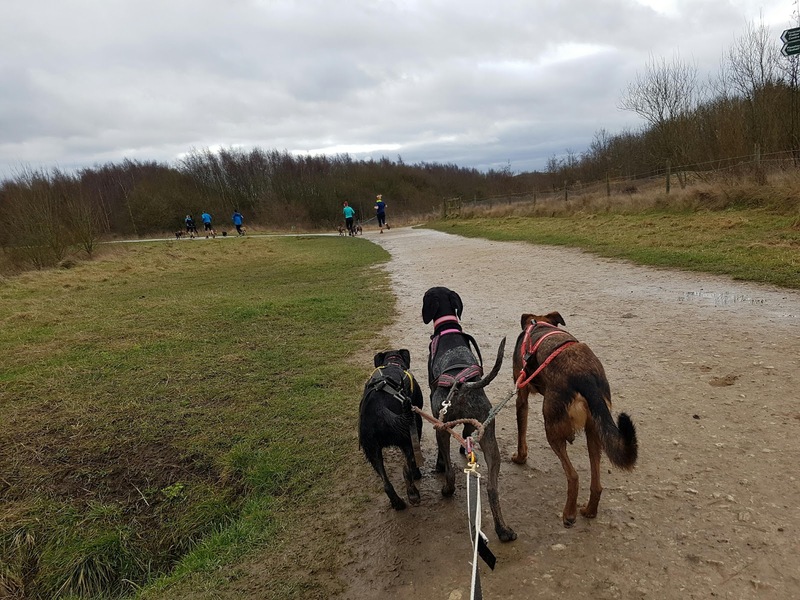 On Sunday there was a social run at Teversal so me and the woofs headed over. 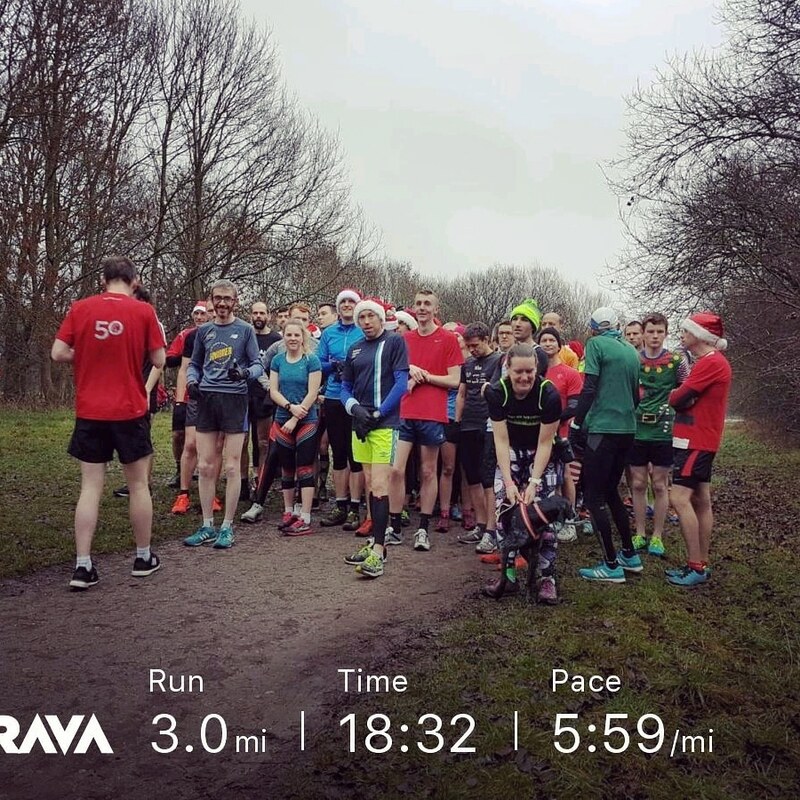 I had planned to run the boys on the main run and Chip on the beginners run. But Chip noisy had other ideas and I'm a soft touch so I ran all three. They were very good and didn't kill me even though George decided to pull as well as the other two. 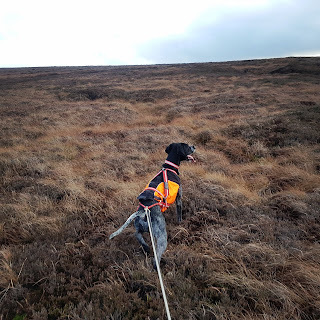 Then Chip and I did the beginner run, she was a very good girl back marking with me. Obviously one of the highlights of Teversal is the super cheap cafe where you can have a three course meal for less than a fiver. Once home I entered a marathon so time to get some long runs in again. Last year I did a number of the Dark and White trail runs but some of the spring ones they didn't allow dogs and this year said it would be a week before they would let us know so I didn't enter. The first event in the spring series is tomorrow and has sold out but also no dogs. 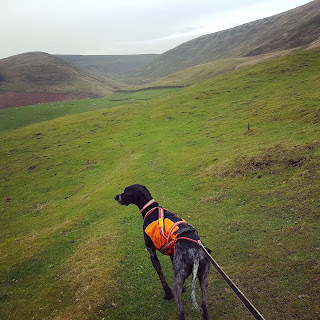 They put the maps online so I plotted it on my OS map, planned parking at the top of the loop and this morning me and Chip went to run the loop. It was good for me to practice my map reading as well. The loop was lovely heading up onto Stanton Moor to Nine Ladies, somewhere I've never been before which is an overnight. We got back to bumble just as the rain started so that was perfect timing. I enjoyed the loop especially the first half (from where I started) and will definitely do more running round there. Although it was snowing a bit at home it was also very windy and rainy and pretty yuck. Ali had a 6.5 mile run on her training plan (she's entered a marathon) so I suggested heading up to the edges to see if we could find snow. We all donned waterproofs and packed spare layers (the dogs go got me to carry theirs) and headed out along the river. 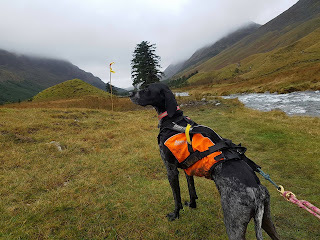 It was pretty horrid weather but good to be out together. 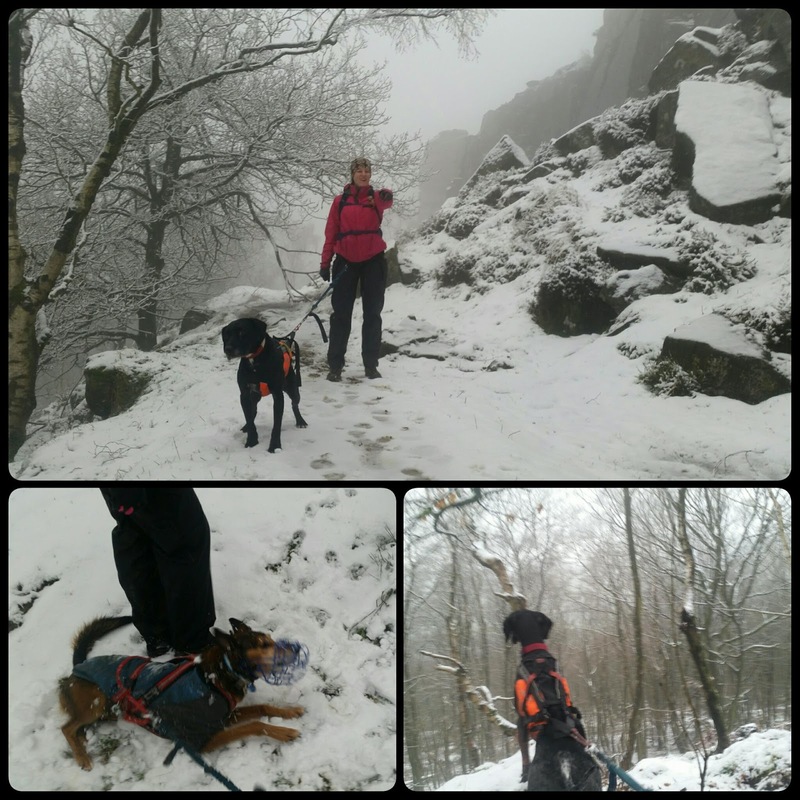 As we started climbing we started to find white stuff. George had a good woogle and we all got excited. Along the edges we were back into the wind and as soon as we started dropping down there was no more snow. 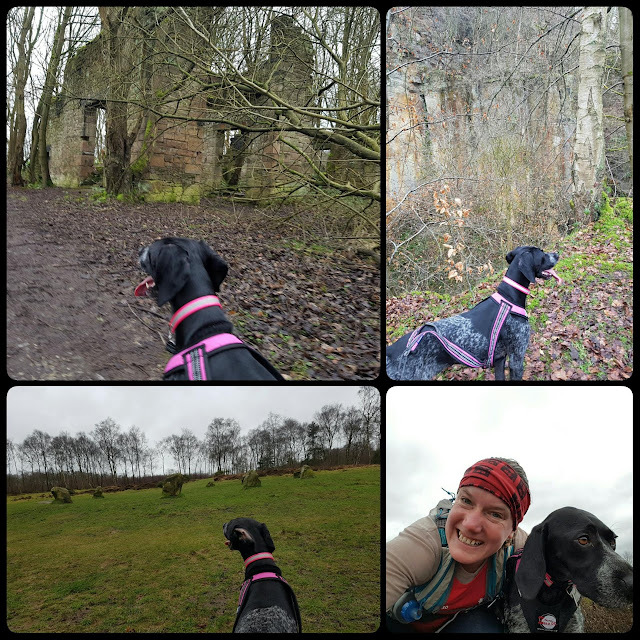 We finished the run at the pub, stripped off our wet layers and had pizza for tea before walking the last bit home. A fab 7 mile adventure from the front door.